Despite the claims made by What the Health, The Noakes Foundation maintains its commitment to a low-carbohydrate, high fat diet as the organization is committed to using, creating and assessing the best available scientific evidence, which maintains that dietary carbohydrates, in particular sugar, offer no health benefits and are in fact extremely damaging to the human body. The best available evidence into dietary fats and proteins, especially those from animal sources, shows that such foods produce a huge range of positive metabolic and disease protective effects, which are indispensable in reversing the global epidemic of obesity and Type Two Diabetes. Undermining the credibility of What the Health, the movie regularly attest to low-quality research evidence, suggests causation from correlation, and at times, simply neglects to reference bold statements. The Noakes Foundation is dedicated to supporting a dietary revolution that will reverse the global epidemics of obesity and type two diabetes. The Foundation has been, and will continue to, conduct research that seeks to correct dietary errors of the past and lead to optimal human nutrition advice. 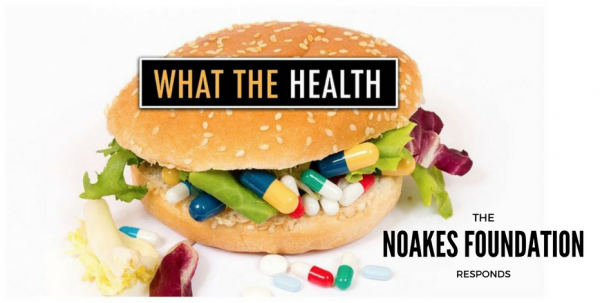 The Noakes Foundation is committed to building, understanding, and synthesising the best available and highest quality research into optimal human dietary patterns. Underpinned by this commitment, and despite the claims made by What the Health, The Noakes Foundation and our teams of medical, research and health professionals are overwhelmed by the mounting evidence that suggests dietary carbohydrates, in particular, sugar, offer no health benefits and are in fact extremely damaging to the human body. Our best available evidence into dietary fats and proteins, especially those from animal sources, suggests that they are not only nutrient dense but also produce a huge range of positive metabolic and disease protective effects, which are indispensable in reversing the global epidemic of obesity and type two diabetes and are very important for the general well being of humans. However, due to the influx of queries we have recently received, we believe that a statement about the claims made in the new documentary What The Health is necessary. It is unfortunate that throughout What the Health, evidence has been selectively cherry-picked, serving to mislead and misinform viewers. When discussing insulin resistance and type two diabetes, no regard is given for the extensively-researched role of low-carbohydrate, high fat diets in improving insulin sensitivity, blood sugar levels and other biomarkers when compared to higher carbohydrate and lower fat diets. Low carb diets have consistently proven to reverse insulin resistance and type 2 diabetes better than high-carb, low fat approaches, and there are “plant based” low carb approaches which have also shown these benefits, but this inconvenient fact gets no airplay. It became increasingly apparent to us that the film is attempting to push the grain and sugar agendas. It is also unfortunate that throughout What the Health, no discussion is had regarding the role of flavour combinations with carbohydrates and sugar in building hyper-palatable foods, which serve to dysregulate the human appetite and promote dangerous overeating and metabolic ill-health. Such information bias is seen throughout, and is only strengthened by the fact that almost every person who appears in the film is vegan – little to no attempt is made to seek out contradictory viewpoints. Throughout the film, the producers regularly present low-quality research evidence, suggest causation from correlation, and at times, make bold, dramatic statements without referencing the source of the information. This undermines the credibility of What the Health. The producers do not mention whether the statistics they frequently reference are in terms of relative vs. absolute risk and instead use eye-catching numbers and tag lines which have no basis in the current scientific literature. The evidence provided on the ‘facts’ section of the What the Health website is unfortunately not without bias, and reference to gold-standard research, including randomised controlled trials, is lacking. While What the Health appropriately recognises the significant and detrimental influence of multinational pharmaceutical and processed food industries have on our food supply, governmental health regulation ‘authorities’ and societies, and the dietary advice we are given, What the Health neglects to acknowledge that such influences are not limited to industrial meat and animal products, but also include the grain and sugar industries. Such influences create bias. The Noakes Foundation prioritises learning from the broader scientific community who have conducted robust research into human nutrition. We are committed to assessing all sides of a debate, critiquing evidence, and ensuring that claims made in the media are honest, unbiased and are evidence-based, as such, we are unable to support the claims made in What the Health. We aim to ensure that our community be provided with information that is balanced, evidence-based, and that has been produced without economic or other undisclosed interests. We do not believe that the best possible evidence or motivations underpinned What the Health. Based on such commitments, The Noakes Foundation remains one of the many passionate advocates of a low-carbohydrate, high fat diet and will continue to assess, appraise, as well as conduct, rigorous scientific research into optimal nutrition in order to continue to provide the best possible dietary advice to South Africans, and the world. For a comprehensive breakdown of the science used in the film, read Nina Teicholz review on the Diet Doctor website. Click here for another review by Robb Wolf.